This winery was known for nearly a century as Dott. G. Cappellano . The official name of the winery today is Cappellano Teobaldo ed Emma ss , though Dott. G. Cappellano is still used on their Barolo Chinato. Here is a photo of the 1861 Cappellano Barolo. The official name of the winery today is Cappellano Teobaldo ed Emma ss . On their labels, they now use only Cappellano except for the Chinato which still uses Dott. G. Cappellano . As far back as 1927 (and probably well before that), the winery was listed on labels as Azienda Agricola Dott. G. Cappellano with di Cappellano & C. beneath that. After Teobaldo Cappellano took charge of the winery (in 1970), the labels began to have di Cappellano T.R. under Azienda Agricola Dott. G. Cappellano . 1985 seems to be the last use of "Dott. 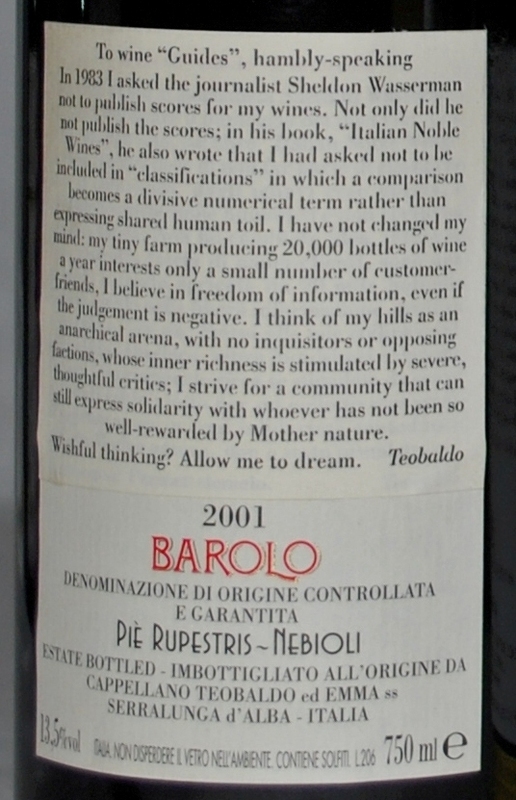 G." on Barolo labels. 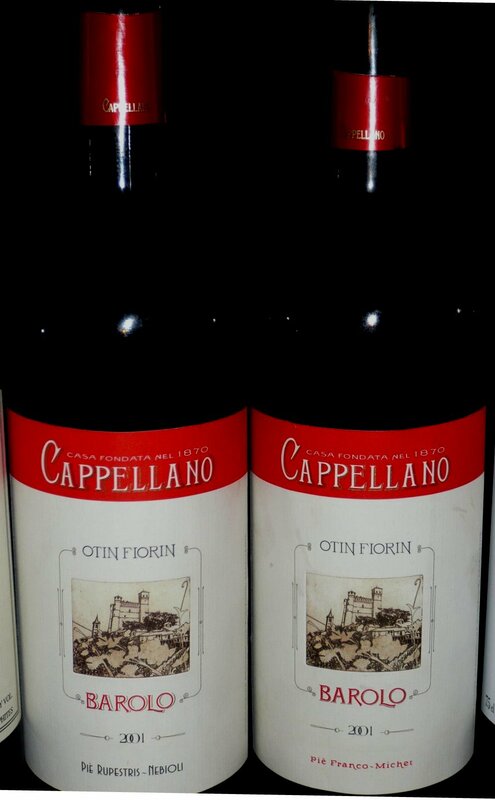 In the late 1980s and early 1990s, the wines were labeled Cappellano T.R. s.n.c. , but some bottlings from the late 1970s where already labeled this way. The "T" stood for Teobaldo. I believe the "R" stood for Roberto, perhaps a cousin of Teobaldo? From that time until the present, the wines are labeled Cappellano Teobaldo ed Emma ss . The winery was founded by Filippo Cappellano who bought almost 60 hectares of vineyard. He had been a notary by profession. Officially, the winery says it was founded in 1870, however a Barolo was produced as far back as 1861. According to A Wine Atlas of the Langhe, Filippo had 2 sons and 2 daughters. When he died in 1886, the estate was split among his 4 children. Partible inheritance was the common practice in Piedmont. However, as was also common practice at the time, each daughter was bought out by her brothers in return for a dowry of 100,000 lire. Giovanni Cappellano, being the older of the 2 brothers, dropped out of university to manage the winery. His younger brother, Giuseppe stayed in school, eventually earning a doctorate in pharmacy. Giovanni ran and expanded the family business including opening 2 hotels in Alba and Serralunga, but he died suddenly in 1912 from a tropical disease which he caught in Tunisia while searching for phylloxera-resistant grape vines. This forced Dott. Giuseppe Cappellano to return home from Turin where he had already developed a successful business by inventing wine-based products including grape jellies, medicines, and most famously, Barolo Chinato. Dott. Giuseppe Cappellanoeventually became one of the legendary figures of Piedmont due to his exceptional leadership of the Cappellano winery, his invention of Barolo Chinato, and his key role with the very large Gancia winery in Canelli. In 1915, the Gancia Winery, already the largest winery in Piedmont, bought the Mirafiore wine brand based in Serralunga d'Alba, with the intention of developing these great Piedmontese wines in their land of origin. Camillo Gancia, the owner of the Gancia Winery entrusted Dott. Giuseppe Cappellano with the management of the winemaking side of this business. Between this and his own winery (now named the Dott. G. Cappellano Winery), Giuseppe became the de facto arbiter of grape prices and vineyard quality throughout the Barolo zone. In 1955, Dott. Giuseppe Cappellano died. The business was then run by 3 nephews of Dr. Cappellano, including Teobaldo's father, Francesco Augusto Cappellano. During the 1950s, 60s, and 70s, Giovanni Troglia, a wine merchant in Turin, bottled many vintages of Cappellano's wines under the name G. Troglia . So far, I have seen them in vintages ranging from 1954 through 1979. He mostly used very oddly shaped bottles, examples of which can be found here with a bit more information on G. Troglia. In these Cappellano pages, I refer to these bottlings as Troglia bottlings and include photos of them on each vintage page where I have photos. Teobaldo Cappellano was born in the Italian colony of Eritrea in eastern Africa in 1944, although technically the British had already taken control of Eritrea and neighboring Ethiopia by 1944. Teobaldo's father had served there with the Italian army, then settled there when he married a local woman. So Teobaldo was the great-grandson of winery founder Filippo Cappellano, the grandson of Giovanni Cappellano, and the great-nephew of Dott. Giuseppe Cappellano. In 1968, Teobaldo's father died. In 1969, Teobaldo moved to Serralunga. And in 1970, took over the winery and began making the wine. In The Mystique of Barolo by Maurizio Rosso, Teobaldo says that he learned to make wine in Eritrea where they made wine from rehydrated raisins! It was Teobaldo who brought the Cappellano name back to prominence by purchasing a quality parcel of vines in the Gabutti Vineyard, reintroducing the Barolo Chinato invented by his great-uncle, producing wine of great quality, and just by being a fascinating character. Sadly, Teobaldo Cappellano passed away on February 21, 2009. He was 65 years old. Here is a lovely obituary on the Polaner website written by Kevin McKenna of Louis/Dressner Selections. The winery is now run by his son, Augusto Cappellano, who had already been managing the winery for several years due to his father's illness. Here is the winery's own website. Here is the winery's page at importer Rosenthal. Around 1985, Teobaldo Cappellano purchased a 10-acre (4-hectare) parcel in the Gabutti vineyard in Serralunga d'Alba from a farmer named Fiorin. Teobaldo named this parcel Otin Fiorin , meaning Garden of Fiorino . The winery had been buying grapes from this parcel since 1976. Starting in the late 1980s, Cappellano began labeling its estate Barolo with both Otin Fiorin and Gabutti (sometimes Collina Gabutti ). In 1989, Teobaldo replanted approximately one third of his Otin Fiorin parcel in Gabutti with Nebbiolo vines grown on European root stock using the Michet clone of Nebbiolo. Note that the vast majority of vineyards used to make quality wines around the world are planted using American root stock due to Phylloxera. 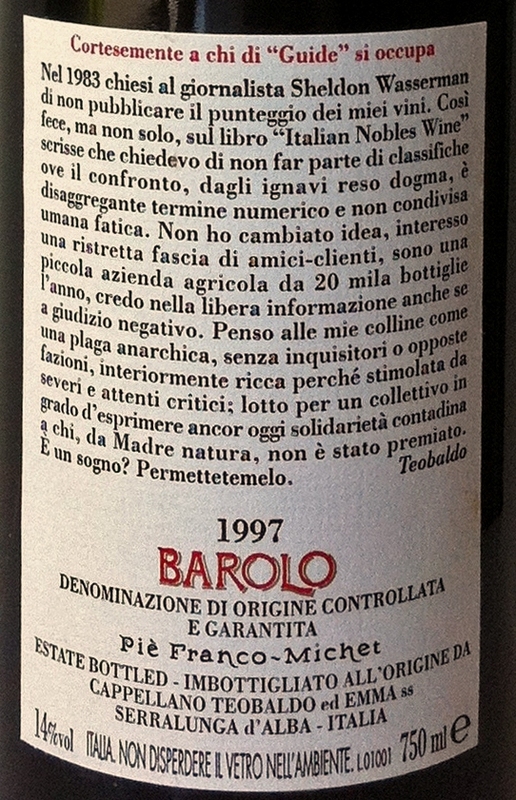 Starting with the 1997 vintage, the wine from only this one third has been labeled with the phrase Piè Franco - Michet at the bottom of the label, while the remaining two thirds of the wine is labeled Piè Rupestris - Nebioli . Piè Rupestris here refers to American root stock and Nebioli indicates that the clones in this portion of the vineyard are a mix of various Nebbiolo clones. Piè Franco indicates European roots stock and Michet refers to the specific clone in that parcel. I had read that Franco here connotes European root stock because Franco means French , but it does not. As pointed out to me by Keith Levenberg, Franco means free or frank as in a frank person . So Piè Franco means free foot . As pointed out to me by Jeremy Parzen (an expert in Italian linguistics), a good colloquial translation of Piè Franco would be free standing , that is the root is not altered (i.e. grafted). In response to my question, Jeremy went into much more detail on this phrase and usage in his blog, Do Bianchi. You can see the difference in labeling between these 2 estate parcels in this photo of the 2001 Rupestris and Franco. It is also starting in 1997 that Cappellano has dropped all use of the vineyard name Gabutti from its labels, only using Otin Fiorin to refer to its parcel within Gabutti. The reason for this is that Teobaldo was unhappy with the expansion of the borders of Gabutti and some of the wines made under this name. In a typical vintage, fewer than 9000 bottles of Rupestris are made and fewer than 2000 bottles of the Franco. The primary vineyard sources for Cappellano in the second half of the 20th Century were Gabutti, Baudana, Carpegna, Parafada, and Vigna Rionda, all in Serralunga d'Alba. In the 1974 vintage, Cappellano did produce at least two single-vineyard wines, one from Vigna Rionda and one from Baudana, and perhaps others. This is only indicated on the back label. This is the only vintage I am aware of where they did this. According to Wasserman, from 1986 to 1989 inclusive, Teobaldo Cappellano made a Barolo from the Carpegna Vineyard in Serralunga d'Alba using grapes he purchased from Giovanni Zunino. Carpegna is near Gabutti. However, it is not likely this wine carried the vineyard name. According to Wasserman, in 1982, Teobaldo made a Barolo from the Parafada Vineyard in Serralunga d'Alba using purchased grapes. Parafada is adjacent to Gabutti. However, it is not likely this wine carried the vineyard name. The Cappellanos made a Nebbiolo d'Alba in many vintages. Here are some examples. For a few years in the mid-to-late-1990s, Teobaldo Cappellano made a Nebbiolo blend called Langhe Augusto. The Fine Wine Geek also has a page on Cappellano Barbera. The Cappellanos made a Brachetto in a few vintages including in 1970 and one in 1974 which I am told was still drinkable in 2011. In 1983, Teobaldo Cappellano asked Sheldon Wasserman not to publish scores on his wines. Wasserman only used a 3-star system for scoring wines, but abided by Teobaldo's request. Other critics such as Antonio Galloni also abide by this request. In recent years, Teobaldo even put this story on his back label in Italian and in English. Teobaldo Cappellano is quoted on the website of Weimax Wines and Spirits saying, What I dislike about this world is the superficiality of thinking that an evaluation mark, set next to my labels in a wine guidebook, might determine a judgment -- be it positive or negative -- on my work into which I have put passion and strong feelings that certainly can't be described by a number. On the threshold of 60 (years of age) I decided to stop accepting marks. Also because when I meet a friend I don't want to be asked what score Robert Parker gave me. But what the hell do I care? I'm an atheist. Should I worry about the judgment of a man?